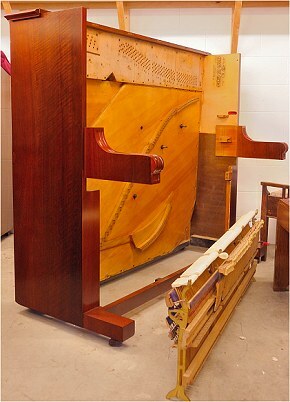 If a piano is of good quality, and structurally sound, then a major service will have transforming results. Our mobile service is equipped to handle most repairs on site. Should a repair require it, our workshop is fully equipped to handle everything. We pick up and deliver. 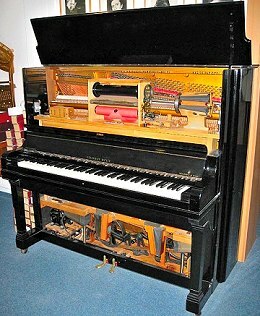 Our workshop stocks a comprehensive range of spare parts for accoustic pianos and player pianos (Pianolas). We can also install humidity control systems to provide your piano with a stable environment. For very worn pianos, a minimalist approach is all that should be done, perhaps tuning the piano to a lower pitch and performing only the most necessary repairs to keep it playing. We'll discuss the practicality of restoration at the time of quoting. Our fully equipped workshop enables traditional and heirloom pianos to be fully repaired, restored and refinished. We renew components such as felts, leatherwork, springs, loops, centre-pins, wrestpins and strings. Our service encompasses cabinet repairs, veneer repairs, lacquer restoration and French polishing. We take a 'whole of piano' approach in the workshop, starting with repair of the castors and finishing with renewal of all leather, rubber and cloth around the cabinet lids and pedals. A specialty sideline is the restoration of player pianos. These self-playing pianos are an heirloom mostly from between the wars so 1919 to 1939. Player pianos are often referred to as “Pianolas” but that is just one trademark of the type. During the 1920's, more than half of all pianos made in America contained a player unit. Phone for an estimation on restoring your accoustic piano or a player piano to it's former glory.